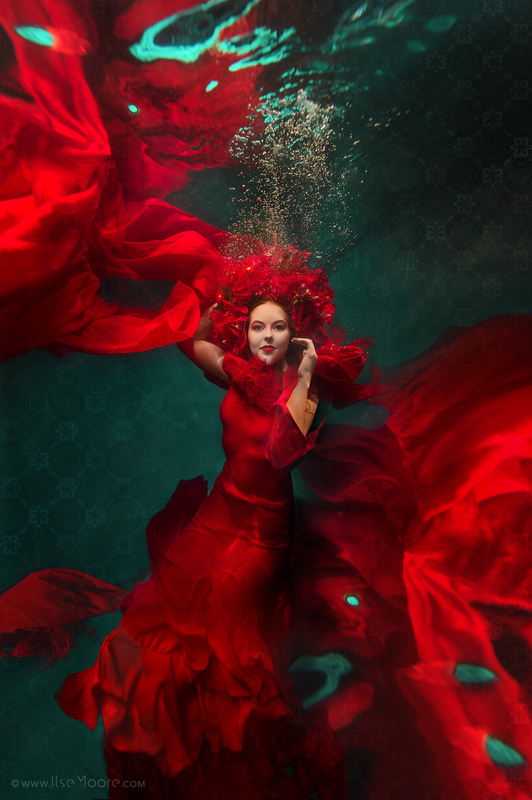 You’re known for being a professional fine art and underwater photographer. What has and continues to draw you towards the majestic underwater realm? I really enjoy that the rules are so different… In the end, all the planning, lighting and styling come down to simple timing and understanding of what we want to achieve between the model and myself. I love spending time in the water and I love watching the scenes we create take on a life of its own. For the few moments we hold our breath and go underwater it feels like being in a different world altogether. Besides the time I get to spend in the water, I have so may ideas and concepts that I still want to try, some very different from what I am doing now and as long as I have something to work and push towards, I am convinced I will never get bored with it. Seeing as water imagery juxta poses ideas such as freedom and captivity, and truth and fantasy, I cannot help but wonder which of the Moulin Rouge! (2011) Bohemian ideals you identify with most? Truth, Beauty, Freedom or Love? This is exactly why shooting in water is so interesting to me! In many ways the four ideals are really twisted into one, as fantasy photography often is, and perhaps more so with the ideas that I haven’t executed yet. In reality I have not explored most of these concepts to the extent that I would like to and I am just touching on it. While simple aesthetics is something that still drives a lot of my work, my goal is to have a more pronounced conceptual meaning in the fine art pieces I create. Water is inherently associated with concepts like freedom and fear, life and death, growth and decay because it is such a strong and powerful force and for much of what I am planning simply staying on the positive and purely aesthetic side of it will be limiting and not do the medium adequate justice. Getting down to business, please take us through a typical underwater shoot? Who do you work with and what are their responsibilities? We are a small team, but much of what we need is in the studio and lighting we use. For fine art or personal shoots I need even less so normally it is only two assistants and I. Their responsibilities is typically concerned with setting up and putting together the lighting rigs that we may need and then one of them will join me in the water for underwater lighting and model assistance and the other will assist from the side. 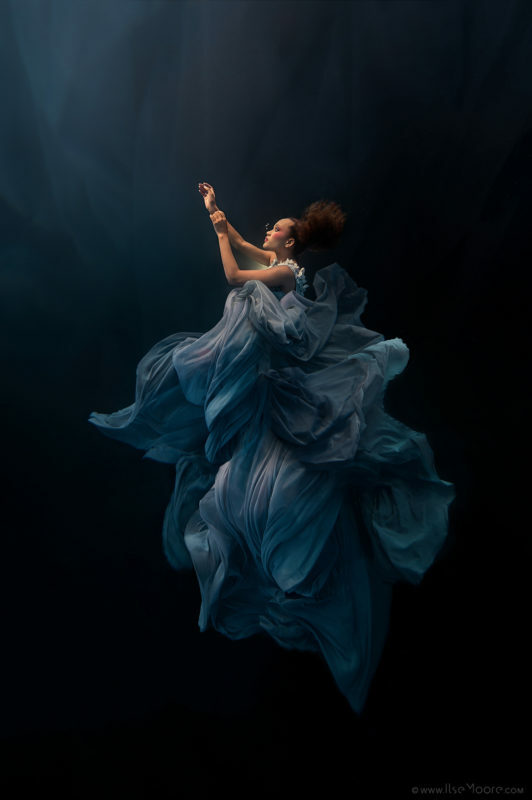 For bigger productions or complex private fine art sessions we will also make use of a make up artist, stylist and a support diver if the water is deep. During these private sessions, the client plays a big role in deciding the look that they want and I occasionally make outfits for them based on these ideas, but will otherwise work with a fashion designer. For my own shoots, I often keep things very simple but I love working with art directors and other stylists, and by doing so, I’ll have the opportunity to create something bigger. Collaborations form a big part of my work. What is you favourite underwater equipment (past and present) and why? I love shooting with my fisheye lens, it allows me to create the feeling of a lot of space when shooting in small areas. With it comes a lot of corrective editing, but it has become such a common part of my workflow that I am now very used to it. Lately however, my greatest “tool” has been our custom underwater studio. With different lighting options and glass panels on the one side I have been able to play more creatively and while I am still in the water for 90% of my shoots, I love doing close up portraits while shooting wide open at f/1.4-f/2.8, something that I can rarely do when in the water because the amount of movement between myself and the model makes correct focus very hard. What are some of the strangest props you’ve used during an underwater shoot? I don’t use props very often, but the strangest thing I’ve ever drowned was a fully styled table decorated with flower vases and ornaments! 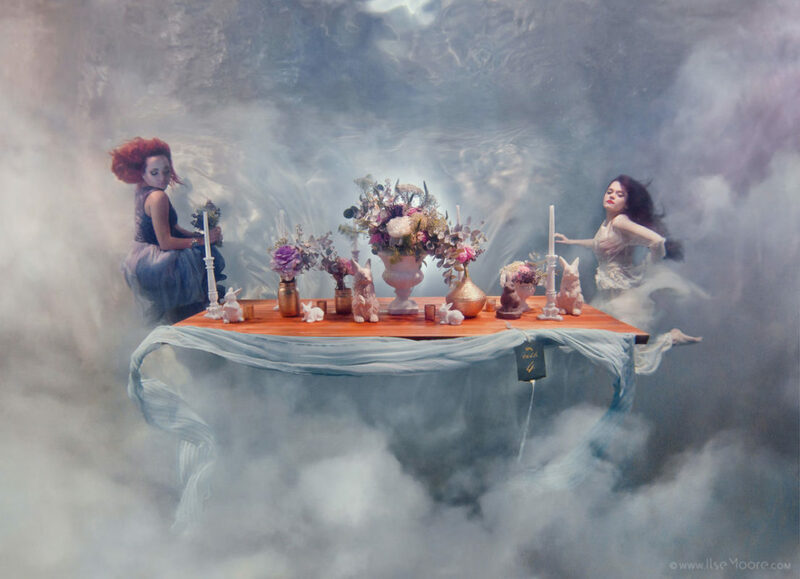 It took two divers to direct the table underwater and tie it down with 50kg of weights. After shooting with the table and two models for approx. 15min, one of the ropes slipped off the side of the table. The table started floating upwards at an angle, spilling all the contents onto the bottom of a 3m pool. Everything was glued down but with the table being a heavy wooden door, nothing was going to stay put! 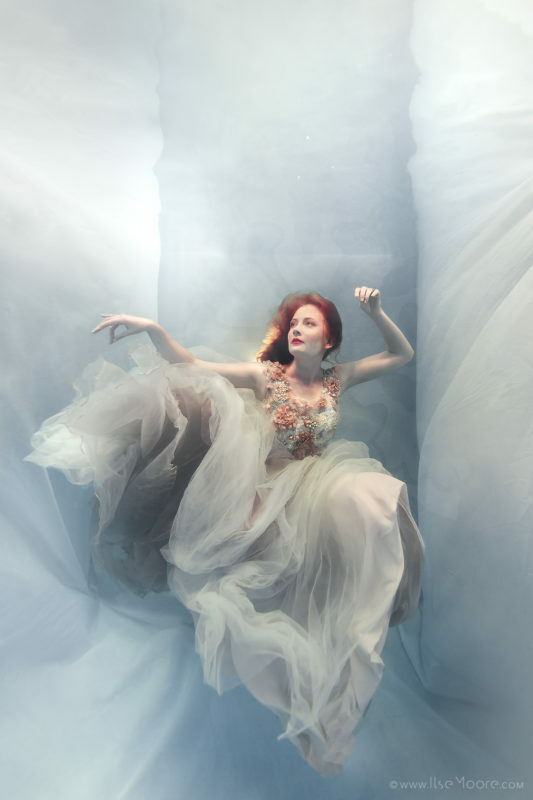 Apart from doing niche underwater commercial, bridal and fashion shoots, you and your husband, Sean Moore, also run a successful wedding photography company, namely GingerAle Photography. How do your (personal) approaches differ in planning and directing underwater versus wedding shoots? The two genres are so different from each other, but the approach is strangely similar…. We shoot mostly reportage style with our wedding photography and like to document real moments as they happen without interference from our side and while underwater photography takes a lot more planning and editing and is a lot more time consuming, the approach once underwater, is not unlike our wedding photography in that I simply “observe” and work towards getting the best shot at the right time! As for the parts where we do give some guidance, for example during the couple shoot at a wedding, the underwater approach is far more specific for first-time private clients. 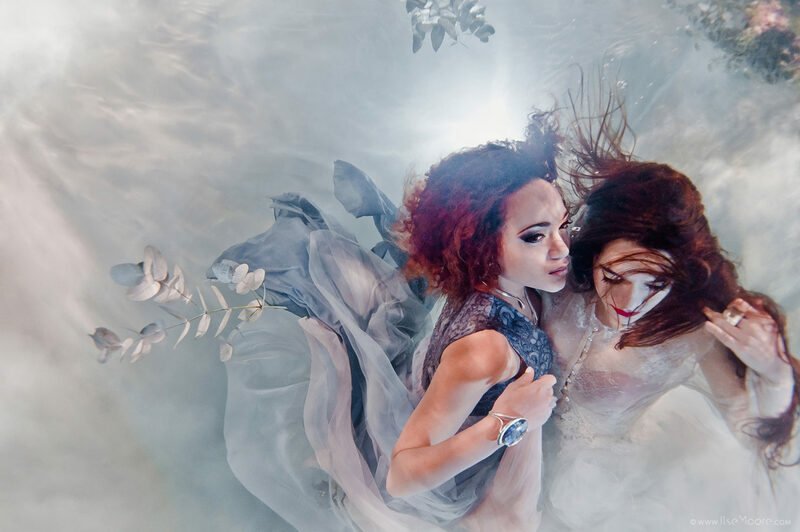 Underwater modeling is very hard and while I fully trust my regular fine art models with my vision and with the direction of a particular series, private clients do need some help in finding their “water feet”. Careful attention needs to be given to everything from facial expressions and hair to hands and feet as well as guiding the dress or outfit – all while looking relaxed and keeping good buoyancy. No pose can be recreated exactly and there is zero communication once underwater, so we work on achieving only a few successful looks. In this sense, the initial approach is vastly different from the way we work with wedding clients, but in the end I still end up shooting what I see. Coming from a visual art background, it is no surprise that you’ve collaborated with other creatives on exciting projects such as Spoegwolf’s “Flikker” music video and Recuerdos, a creative theatre-in-the-round production. How do these collaborations originate, and do you have more exciting “memories” on the horizon? I love working with other creatives, so when an opportunity presents itself that I want to be a part of I am usually on board! My art background has certainly helped in building a network of likeminded people from a wide range of arts whose work I enjoy and admire, so I do hear about a lot of projects happening. I also love participating in local initiatives and simply being involved in creating beautiful work that will hopefully inspire and encourage other local artists. Working with Spoegwolf was such a privilege and while the music video was a KykNet sponsored production, it was such a great experience to collaborate with them on something so special! Coming up we’ve got Recuerdos traveling to the Western Cape in October and November for two more shows, the first in Hermanus and then for five shows in Camps Bay, Pieter Toeriens’ “Theatre on the Bay”. The show brings together three different art principles, music, dance and the visual arts and is something I could not be happier to be a part of! We’ll see where it goes from there! With underwater photography, post-production editing is essential, but I’ve read that it’s during this phase that your concept truly evolves – what nuisances in an image will inspire you in a certain conceptual direction? Absolutely, for me most of it happens in the way I handle the images after the shoot. Strictly speaking, much of my work could be seen as digital artworks and I get to create something unique that I feel makes my work more personal. Naturally with underwater photography, colour correcting and basic editing is crucial, but the way a piece of cloth is shaped or the background is lit by stray lighting can often trigger something and shape the series very differently. Having said that, some of my personal favourite works have been the most raw and unworked images that is inspired by the way the model moves in between poses, especially when working with unusual lighting… It’s not necessarily the images I get the most feedback on, but ones that I feel I connect with the most. Your image captions are beautifully poetic. It’s clear that the entire photographic process inspires you, from inception to presentation, but what do you find most fulfilling about your craft? Yes, I love adding short writings to go with the images I create. I often write these myself based on the idea behind the image. I’m not very chatty on social media, so I find that these writings do a better job of adding to the image than otherwise. I am very opportunistic and instinctive in my shooting style and sometimes get distracted by new possibilities during a shoot. This freedom enables me to pour a lot more passion and creativity into the shoot which is probably the most fulfilling part of what I do. In fact, this same spontaneity often spills over into the editing room and because of it the images take on a life of its own. I feel most fulfilled when I look at an image and it makes me want to get back in the water. Anna Bannink is an experienced copywriter with a penchant for digital content, strategy and design. Thank you for a lovely interview, Anna! It was such a pleasure! The underwater “world” captives me as does your conceptual approach towards art. Please let us know of any exciting future projects/collaborations?